We’ve been a big quiet on the blog front in the last few weeks – but for a good reason! We’ve been busy adding lots of shiny new products to our website! And boy has it been worth it! First out of the blocks has been Umbra, with a gorgeous new 2017 collection! From new multi photo frames to kitchen accessories, their new products are reflective of the interior trends coming through – including teal and iridescent hues. It also indicates that the big 2016 trends of copper and tropical motifs are still going strong! Below are a few of our favourites from the new Umbra collection! Keep your eye on the blog over the next week or so for new product announcements – and also check out all of the lovely newness on our New Additions page! Umbra have introduced some lovely new colours to their sink accessories collection: teal, canary yellow, avocado and charcoal. We love these new hues – especially teal, which is set to be a hot trend this year! Here at Red Candy, we’re big fans of adding a bright accent colour to the kitchen, so we’re delighted to see these new bold shades coming through! Teal teal and more teal! …And talking of teal, it’s not just the kitchen that’s benefiting from this new en-vogue shade! Umbra’s best-selling Woodrow and Skinny bins have been given a trendy teal makeover – this may just be our favourite finish of the Woodrow yet! Umbra have just introduced this gorgeous Wine Rack to their Pulse collection. 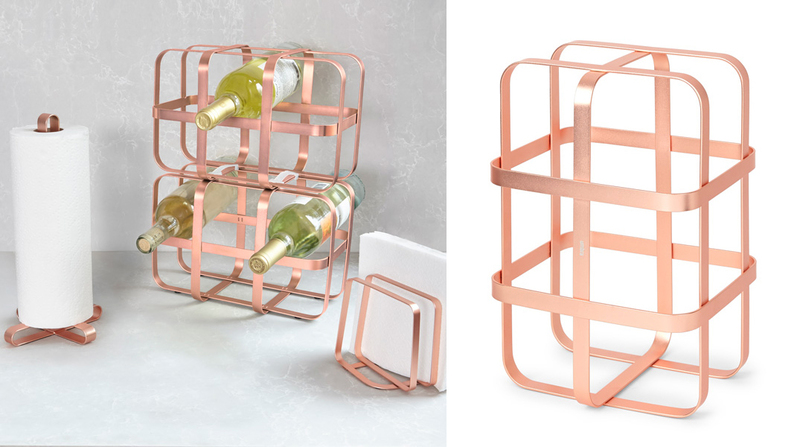 This sleek stackable bottle holder would look at home in any industrial or modern style interior spaces, and will keep the vino in easy reach now Dry January is over! We also think the teal and copper colour combo could be big this year – so watch this space!! Iridescent is the shiny new trend! With bold and bright rainbow hues set to be a big trend for 2017 (albeit a potentially “love or hate” one), Umbra are tentatively dipping their toes in this new style. The result: the gorgeous Icelet and Jacks Rainbow Ring Holders, which will add some much-needed shine to your dressing table! We love them! We always love Umbra photo frames, and so we couldn’t wait to get our hands on their Corda Photo Displays! The designer of these quirky yet stylish creations has mixed up the traditional method of hanging photo frames up with a piece of string, by incorporating the string into the frames themselves. Tropical is still packing a (fruit) punch! The tropical trend was huge in 2016 – with pineapple, cactus and flamingo motifs being present in most designer collections. The Paradise Copper Wall Decor wall sign shows that the trend is still going strong – plus it’s a great way of shouting to the world that your home is a little slice of paradise! The brand new Umbra Edge Multi Photo Display features unique angles and depths which will make it a brilliant talking point in any room! It comes in natural and walnut finishes, can hold 11 of your most treasured photographs, and can be hung in four different ways. Plus, when mounted in a landscape orientation, a handy shelf area is created; for all your little knick knacks! The Umbra Buddy Chess Set is a visual delight which is sure to set your guests’ tongues wagging. Unlike most games which are tidied away after use, this stylish chess set is intended to become part of your home décor! The Umbra Senza Photo Frames feature beautifully understated slim borders, which are ever-so-slightly curved, so that the eye is naturally drawn to the snaps held within! This sleek range comes in different sizes and finishes – including copper and brass. 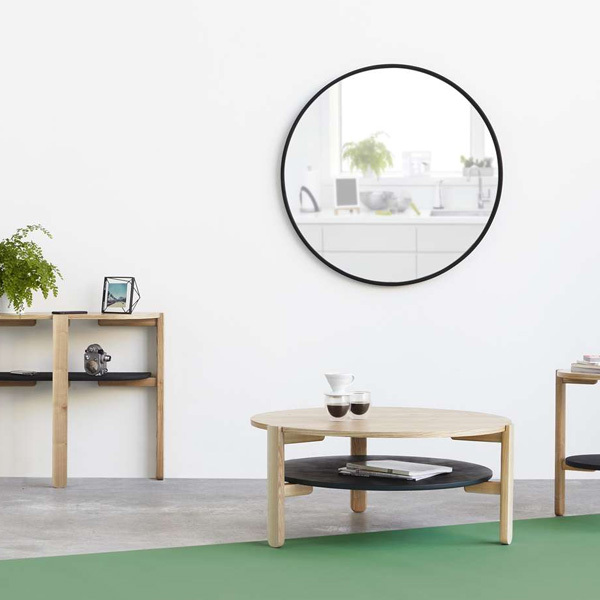 The Hub Oversized Mirror is a giant circular wall mirror which could just be that striking focal point your home has been waiting for! Measuring an impressive 36” (94cm) in diameter, the Hub will add the illusion of extra space to your chosen room, as well as enhancing the lighting in the space. Check out the entire Umbra range here and all of our New Additions here!